Payment products for great companies of all sizes. Whether you’re looking to bill on a recurring basis, offer financing, PayPal, or simply accept card payments in your e-commerce store or app. Hips ensures a higher financing acceptance rate by offering multiple financing options from several creditors in your checkout. No start fee, no monthly fee, merchant account included. Optional: Above price added to relay payments (PayPal, AliPay etc.) if added to Hips checkout. Get started with Hips! Download our payment plugins for Magento, Shopify, WooCommerce, Opencart or Prestashop. 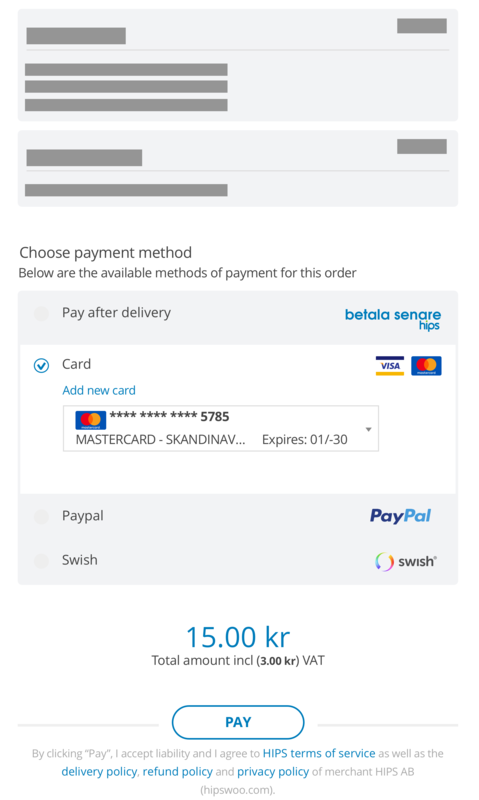 Replace your current checkout and increase your convertions - customer identification, credit marketplace and shipping selector. All payment products included in a one-page checkout from Hips. Simply accept payments in your e-commerce store or app with Hips full stacked payment solution. Bill your customers with one-off invoices or automatically on a recurring basis. Go global with support for different payment methods, international cards and multiple financing options. Get a higher acceptance rate on high priced product by offering multiple financing options from several creditors in your checkout. Hips solves shipping for merchants regardless of whether you have your own agreement with carriers or buy shipping directly through your Hips account. Create an account today and start accepting payments within hours.